High whale blows appeared on the horizon. They were looking very different to humpback’s blows, which we have seen a lot this day. 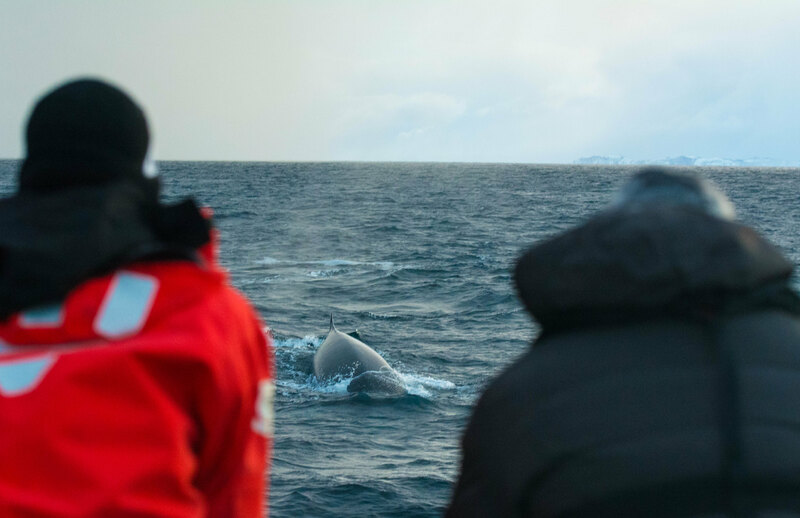 After a short time we have realised that it was a large pod of finwhales, about 25 individuals. No one of severe polar explorers on our ship have ever seen such a big group. Finwhales basically travel alone or in small groups up to 6 individuals. If you say that humpback whale is big, than the finwhale is titanic. Surface has been cutted apart by powerfull and smooth backs of the whales, and the sound of their breathing thundered in the air. That time I’ve realise how the legends of sea serpent were born. Pictures can’t give you a feeling of primal power we were gifted to touch. We didn’t got close to finwhales under the water, but at least we have made an effort to do so. This giants are extremely shy and immediately turn away from the boat, so there are only few underwater pictures of finwhales in the internet. Facts about finwhales: Finwhale is the second largest animal on the planet, which can grow up to 27 meters long and weight 70 tons. Finwhale and the biggest creature ever, the blue whale, are such evolutionary close species, that they can breed each other and give birth to hybrids. Finwhales prefer feeding on krill, but here in Lofoten they join orcas and humpbacks for the herring feast.